Click the “play” arrow to watch, then scroll down for the printable recipe. Think you’ll give this healthy and delicious dinner a try? Talk to me in the comments field below. A fast and fabulous dinner of tender-crisp vegetables and meltingly-tender salmon. A great weeknight or company dish. Center the oven rack, and heat the oven to 425°F. Scatter the vegetables on a large baking sheet, lightly drizzle them with olive oil, and then toss to coat. Put the baking sheet in the preheated oven, and cook for exactly 15 minutes. While the veggies are cooking, quickly marinate the salmon: In a medium bowl, whisk together the soy sauce, cornstarch, vinegar, olive oil, and Sambal Oelek. Add the salmon fillets, turning them, if necessary, to coat both sides. After the veggies have cooked for 15 minutes, arrange the salmon fillets on top of the veggies. Pour the remaining marinade over the veggies. Bake for exactly 10 minutes. Serve the fillets over hot, cooked rice or quinoa. Wine pairing: Pouilly-Fuisse. NOTE: For extra-easy clean up, line the baking sheet with aluminum foil. This is going to be tomorrow nights dinner! Can’t wait! Hi Anne – Yay! Let me know how the recipe works out for you. It would be wonderful to find wild-caught salmon. I’ll substitute Hoki from the pristine waters of New Zealand! p.s. I grew lavender using your winter seed method last year and the plants have established themselves enough to have made it through this winter! Thank you so much for all the inspiration you provide by making everything so EASY and FUN to do. Made this last night Kevin, and it was divine! Used cauliflower instead of broccoli, so added more green pepper for color. Did not have Sambal Oelek in the house, so used 2 Tbsp of a homemade green sauce (parsley, cilantro, garlic and lemon juice) plus a heaping tsp. of Berbere spice. It worked beautifully, and clean-up was oh, so easy! Thanks for the continuing great ideas. We tend to eating most of our veggies raw – but this sounds easy, appetizing and will definitely be on the menu. Thanks Kevin for another look-good/taste-good recipe. Hi Frances – If you try Hoki as a sub for salmon, please let me know how the recipe turns out for you. Hi LynnAnn – Thanks for watching my videos. Enjoy this delicious sheet pan dinner! Hi Vicki – Music to my ears. Thanks for the review! Hi Joan S. – I think you’ll like the tender-crisp veggies. Let me know how the dinner works out for you! Will have to ask Google what a Sambal Oelek is. Sounds like something from the salamander family. If it’s gluten free though, my husband will eat it. 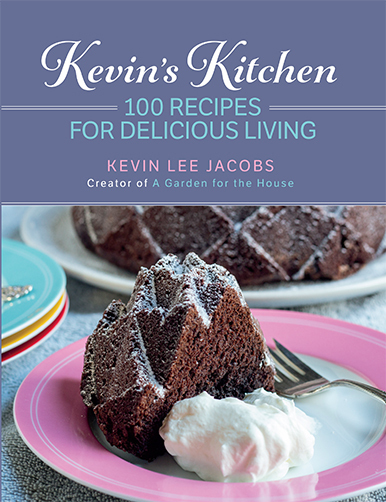 Thanks Kevin for all the great recipes to try. Hi Lynda – Sambal Oelek is a uniquely-delicious chili paste. In my supermarket, it’s on the same shelf as soy sauce, teriyaki sauce, etc. Available from Amazon, too. Hi Pam – Glad the like the chicken version of this recipe. I’m with you on sesame oil: love it! Another winner Kevin!! I so love your site and recipes! Could I substitute the salmon with tuna? Would 10 minutes be adaquate time to cook the tuna? Hi J – Tuna steaks could be subbed for salmon fillets, but you might have to experiment with timing. Steaks that weigh 5-6 ounces usually require 10-12 minutes at 425°F. Sounds delicious..similar to the chicken sheet pan recipe, which I made..It was a hit..I subbed Sambal, because I couldn’t find it, with Siracha,- a chili sauce..It worked fine..thanks look forward to trying the salmon..
Hi Barbara – Yes, very similar to my chicken-and-veggies sheet pan dinner, and equally delicious. Enjoy! This looks amazing. I will try it tomorrow evening for our family’s “Tuesday is Sunday Dinner”. I have come to trust that if you say it’s good, I know it’ll be good! All I need to do is follow your instructions. Your videos are perfect and so easy to follow! 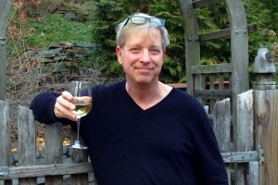 Thanks for sharing your recipes and ideas. I’m definitely trying this tomorrow. Loved your video, and thanks for the tip about how to cut peppers without having to deal with the seeds. Can’t believe I didn’t think of that myself. Just sent my husband out for the veggies; already have some nice salmon. I just subscribed. Where do I find the chicken pan sheet recipe? Hi Patricia C – Thanks so much for watching the video. Let me know how the dinner turns out for you! YUM! My husband also loves salmon, peppers and broccoli. He cannot, however, deal with any heat in his food, so I will do what I always do when a recipe calls for anything spice and prepare two smaller pans of this wonderful stuff – his without the sambal, mine with it. This will probably be dinner tonight. And here I was wondering what to cook! Oh this looks SO good. I will be making it for sure the next time we have salmon and I think I will try it with chicken also. The marinade looks totally yummy. I love the idea of the sheet pan dinner, because it makes so much and yet you don’t need to work at it all day. Enjoyed the video. 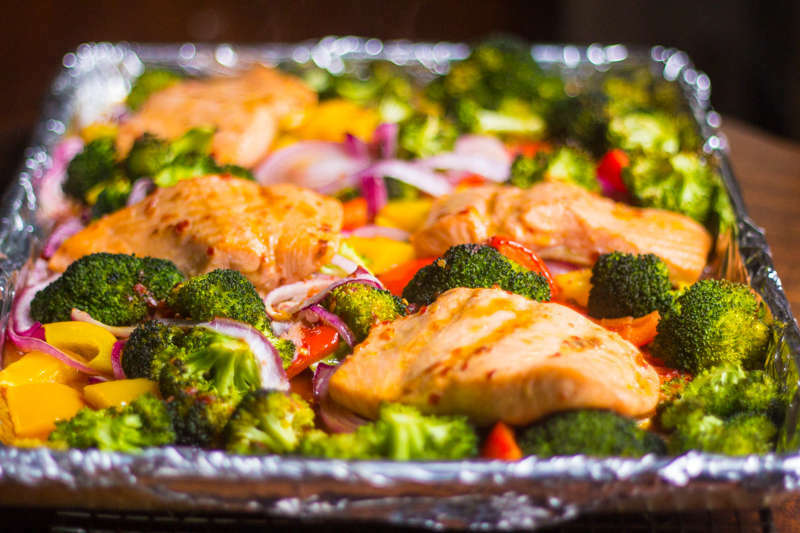 Hi Kevin: I had been looking for a sheet pan dinner using salmon and when your recipe and video (love your videos!) came to my inbox, I printed off the recipe and made it tonight for dinner. What a hit it was with my husband and myself! I followed your instructions exactly and the salmon came out absolutely perfect, as did the veggies. The cornstarch in the marinade served to thicken the juice and provide a wonderful and very tasty sauce. Everything was cooked to perfection and cleanup was a breeze! This brilliant and easy recipe will become a regular in my dinner rotation. Thank you so much for this excellent recipe and for all that you do! Any suggestions for a substitute for the Sambal? Hi Samantha – If you have a chance, do let me know how the two different marinades (sambal and no sambal) work out for you. Hi Julie – To save even more time, you can chop and refrigerate the veggies way, way, in advance. Hi Sharon – Thanks so much for the review. Glad you like my videos, and that this particular sheet pan dinner was delicious for you! Yep, that is a great tip to chop veggies and refrigerate ahead of time, Kevin. Thanks. I use that tip when ever possible. I just did that over the weekend when I made Habanero Pesto Pasta Salad. I prepped the veggies one night and the next day all I had to do was to make the sauce, cook the noodles and combine it all. Have not made the sheet pan dinner yet, but I am so looking forward to trying it. This sounds great! I need to pick up the ingredients. I love your cabbage, apple, and pork chop sheet dinner. I make it all the time and cook brown rice to go with it. Thank you so much for your great blog. I love it!! Made this yesterday for dinner, absolutely delicious ! Will be one of my regular favorites, and being so quick and easy is another bonus. Thanks Kevin, watching you cooking in your videos is a pleasure too, clear good teaching with a pinch of humour, love it. I’m not a cook but I can fake it with all the Sheet Pan recipes by Kevin. Merci mille fois.